On Mon. July 21, the Detroit Water & Sewerage Dept. (DWSD) announced in federal bankruptcy court before Judge Steven Rhodes that there would be a 15-day suspension of water shut-offs while policies would be enacted to address the current crisis in the city. Additional measures were revealed which are purportedly designed to address the massive termination of water services for thousands of households in the economically distressed majority African American municipality. This declaration in federal court from the DWSD culminated a week-long series of activities that focused national attention on the plight of working and poor people in Detroit. A mass demonstration through downtown’s financial district on July 18 attracted thousands representing local organizations, the National Nurses United (NNU) and the delegates of the Net Roots Nation Conference held at Cobo Conference Center July 17-19. During the objections hearing on July 15, Kris Hamel, representing the Moratorium NOW! Coalition, brought the question of the water shut-offs into the federal bankruptcy proceedings for the first time. Over 600 rank-and-file people filed objections to the so-called “plan of adjustment” submitted by emergency manager Kevyn Orr which would slash pensions, privatize public assets and create the conditions for the long term disempowerment of the residents of the city. Hamel called upon Judge Rhodes to declare a moratorium on the water shut-offs, noting that the impact of the terminations had drawn the condemnation from the United Nations and other organizations locally and nationally. Rhodes then ordered Jones Day law firm, which is in fact administering the affairs of the city under emergency manager Kevyn Orr, a former partner in the firm, to compel the DWSD under their direction to come to the court and explain its program to prevent shut-offs. At the same time on July 21 it was announced publically that a class-action lawsuit had been filed in the bankruptcy court demanding a moratorium on the shut-offs saying that the actions by DWSD at the aegis of emergency manager Orr represented a violation of due process. There were a number of plaintiffs in the filing including victims of the water termination actions along with the Moratorium NOW! 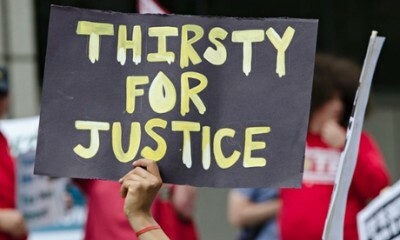 Coalition, the Michigan Welfare Rights Organizations (MWRO), the People’s Water Board (PWB) and the Michigan chapter of the National Action Network (NAN). The social and political situation in Detroit gained renewed national and worldwide attention July 17-19 during the convening of the Net Roots Nation Conference. The conference brings together progressives, labor unions and left-wing Democrats who are heavily focused on blogging, video streaming and a myriad of social media networks. Officials of the National Nurses United (NNU)–which represents 188,000 health care professionals–who were strong participants in the Net Roots Nation Conference, contacted the Moratorium NOW! Coalition and other local organizations to inquire about how they could lend their assistance to the struggle against water shut-offs, emergency management, privatization and the bankruptcy currently plaguing the city. Moratorium NOW! Coalition organizers immediately suggested that delegates from the conference should come out into the streets for a mass demonstration in solidarity with the people of Detroit. In less than two weeks all of the major grassroots organizations working on the water crisis, the theft of pensions, privatization and other issues, came together in conjunction with the NNU and the National Election Integrity Coalition (NEIC) in order to mobilize the Net Roots Conference delegates and labor unions in support of the July 18 actions. Through the work of the NNU, endorsements were secured from the Detroit Metro AFL-CIO, UAW Local 600, the Amalgamated Transit Union (ATU) Local 26, the Communications Workers of America and a host of other labor organizations. By the afternoon of July 18 thousands had taken to the streets for a march from Cobo Center through the financial district passing the Coleman A. Young Municipal Center (CAYMAC) into Hart Plaza for a rally. This represented the tenth consecutive week of “Freedom Fridays” organized by the Moratorium NOW! Coalition, where rallies and demonstrations outside the federal courthouse, and later the DWSD headquarters, would spread into other areas of the downtown financial district. Speakers at the July 18 rally included a representative from Moratorium NOW! Coalition, Maureen Taylor of the MWRO, Cong. John Conyers, journalist John Nichols, Monica Lewis-Patrick of We the People, Jerome Goldberg of Moratorium NOW! Coalition, Vanessa Fluker, people’s lawyer, Helen Moore of the Detroit Public Schools Education Taskforce, Cecily McClellan of the Detroit Active and Retired Employees, Bonnie Castillo, RN Director of the Registered Nurse Response Network/ NNU, Jean Ross, RN, Co-President of the NNU, Rev. Charles William II, president of the Michigan NAN chapter, Lila Cabbil of the People’s Water Board, Dennis Williams, new president of the UAW International, Jean Vortkamp, community activist, Rick Blocker, president of the Metro AFL-CIO, Elena Herrada, member of the Detroit Board of Education, among others. The demonstration gained national and international coverage. Earlier in the day the second blockade at Homrich corporation, the private firm hired by the emergency manager to assist in the water shut-offs, took place resulting in nine arrests. Note: This writer co-chaired the rally at Hart Plaza on July 18 along with Bonnie Castillo, Director of the Registered Nurse Response Network of the National Nurses United. In addition to the rally on July 18, the same writer addressed a plenary at the Net Roots Nation Conference on July 19 dealing with the water crisis in Detroit.